The generally-accepted story is that the strawberry, meringue and cream pudding was dropped at an Eton v Harrow cricket match in the late 19th century. Rather than waste the food, it was simply scooped up off the floor and served, smashed to bits, in individual bowls. There is an alternate version, involving a labrador and a picnic in the 1930s. That one, however, can’t be true – the first record of the name in print dates to 1893. But there is yet another take on the ‘Eton Mess’ conundrum which comes from a 2012 cookbook of recipes popular at the famous public school, and with those who once went there. Among the ‘gems’ in The Eton Cookbook, compiled by Caroline Waldegrave and Sandra Robinson, were Boris Johnson’s recipe for cheese on toast (‘grill until it gets all nice and scabby’), Sir Ranulph Fiennes’s for chocolate sauce, Bear Grylls weighing in with Huckleberry Chocolate Pie, actor Eddie Redmayne’s slow-cooked Italian lamb, MP Tam Dalyell’s West Lothian Porridge and the Duke of Kent’s fish soup. But Eton Mess was tackled by former Tory minister William Waldegrave, who also took on the issue of how ‘Eton Mess’ got its name – and he declares that it doesn’t actually exist. ‘Whenever I find “Eton Mess” on the menu, I become irritable and pedantic. “There is no such thing!” I cry,’ said Waldegrave. Waldegrave’s hopes of convincing the rest of the world to stop calling strawberries, cream and broken meringue ‘Eton Mess’ are, of course, as vain as his hopes of returning to high office – or, indeed, of the people of Bologna convincing the English that ‘Spaghetti Bolognese’ should be called ‘Spaghetti with ragu’. But Waldegrave can keep his hands off claiming ‘Banana Mess’ – that is generally credited to a similar culinary disaster at Lancing College, on the south coast near Worthing. Whisk the egg whites until they form soft peaks. Add the caster sugar gradually and continue to whisk until thoroughly mixed. Place rounded spoonfuls of the mixture on a lined baking tray and bake for an hour at 275°F. Leave the meringues to dry out overnight. Chop half the strawberries and put them in a blender with the icing sugar. Blend until smooth and sieve to remove the seeds. 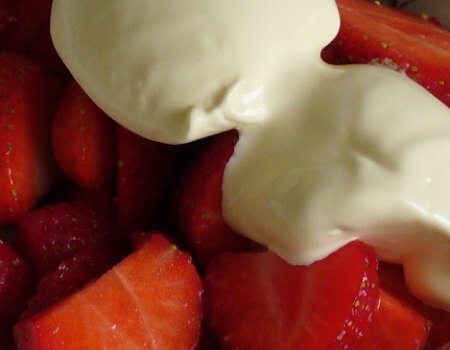 Chop the rest of the strawberries and whip up the double cream. Break up the meringues into about one-inch pieces, put them in a mixing bowl, add the strawberries and fold the cream in around them. Gently fold in all but 2tbsp of the puree to give a marbled effect. Place the mixture in a serving dish and spoon the rest of the puree over the top. Serve immediately. Preferably without dropping, and away from excitable labradors or irate former ministers of state.